Purchase a new Honda Civic Euro Headlights, Fog Lights and Front Grille today with K2 Motor. With our best deals you can't go wrong. Brand new COMBO: 96-98 Civic 2/3/4 DR Black Euro Headlights + Yellow Bumper Fog Lights + Black Mesh Grille! Euro headlights provide an intensely concentrated light beam with an innovative design that gives your car a unique look. For only a fraction of the cost of oem headlights, you can replace your old faded or damaged headlights with eye catching headlights. Not only do the new lights refresh the look of your car they are also brighter, making driving in the night and unlit streets a lot safer. The headlights are securely mounted using the original screws & nuts of the oem parts. If you are unsure about installing automotive accessories by yourself we recommend consulting a body shop. The grilles are made of high quality ABS Plastic, and feature flat black finish. You'll be surprised by the bold & aggressive look of your car provided by this grill. Our high quality Civic fog lights are water proof and shock resistant. Made to improve visibility during night, rain, fog and snow. 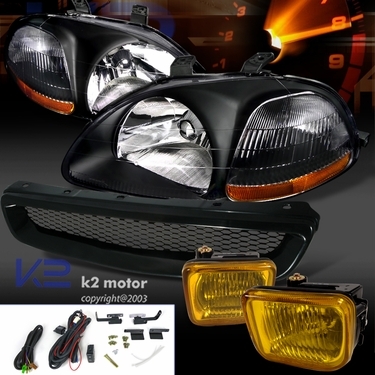 This set of fog lights are made to be easy to install, no modfiication required.